MLB World Series 2016 Chicago Cubs All Pro Baby Bib - $9.99 - GolfersEdgeOnline.com - Best Golf Equipment On The Web! 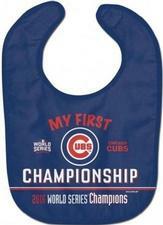 Let the world see your babies Cubbie Spirit with the World Series Champs All Pro Baby Bib. Officially licensed baby bib made of two ply soft polyester front and absorbent cotton terry back. Decorated with a fun full color imprint. Finished with adjustable baby velcro. Printed in the USA with imported fabric. If you have any more questions about the MLB World Series 2016 Chicago Cubs All Pro Baby Bib; do not see the model you are looking for; need custom options; or prefer to not purchase online, then please call us at (630) 656-1291.